ALEX Launches New Website And 100 New Toys! Our newly redesigned ALEX Toys website was made with you in mind! It’s now easier than ever to search and discover toys for your family and friends. You can browse our exclusive collections, award winners, shop by popular category, or use our gift ideas to find the perfect gift! There’s so much to choose from, including 100 new toys just launched and uploaded, so no matter the occasion, we make finding the perfect gift of creativity fun and easy! You’ll also find treasures along the way such as our Little Hands inspired printable crafts, videos that demonstrate our products and provide arts and crafts ideas, valuable mommy tips on the ALEX blog, and real time product reviews and suggestions by people like you. Encourages self-expression – drawing and engaging in other creative pursuits gives kids a voice. I have learned a lot from and about my children by listening in as they create. Builds fine motor skills – many creative pastimes help children develop the fine motor movements that are important for scholastic success. Helps children discover passions – Pretend play and creative expression help children discover what truly interests them. A great way to de-stress – I often set out a creative activity for my kids to do after school, as I find it soothes tired nerves and makes it easy to ease back into home life. This also motivates my first grader to get her homework finished (so we can get started on the activity), and it’s a wonderful bonding time for me and my kids. Now that we’ve covered a few benefits, here are things I do to encourage creativity. 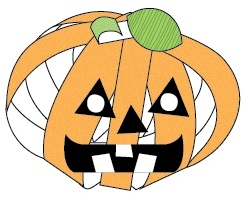 This cute Jack O’Lantern is easy to make and great for decorating the classroom or house for a Halloween party. Make lots with different faces, then string them together as a banner, or hang each individually at the front door to greet your trick or treaters! The kids will have a blast making them and it’s a great way to get their creative juices flowing and involve them in the party planning!